The acting head of the Transportation Security Administration has been removed from the position following a report that found numerous instances where government investigators were able to take prohibited items through airport security checkpoints. Melvin Carraway, the TSA's acting administrator since December, will be reassigned to the Office of State and Local Law Enforcement at the US Department of Homeland Security (DHS) headquarters “effective immediately," DHS secretary Jeh Johnson said in a statement. "I thank Melvin Carraway for his eleven years of service to TSA and his 36 years of public service," Johnson said. Acting TSA Deputy Director Mark Hatfield will take over until a permanent administrator is announced. The Carraway decision was based on findings contained in a recent DHS Inspector General report, according to ABC News. Undercover DHS investigators attempted to smuggle contraband through airport checkpoints and succeeded nearly every single time, the report revealed. 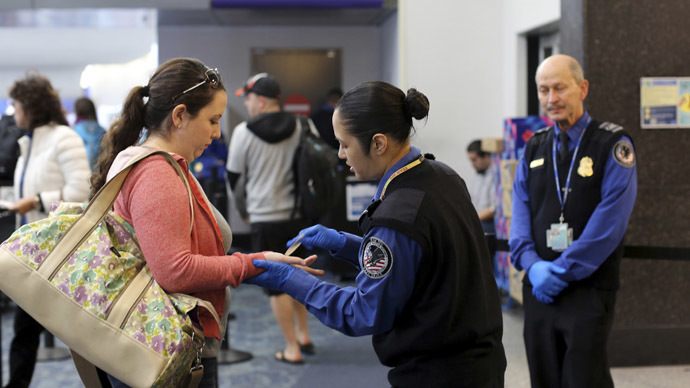 TSA agents failed 67 out of 70 tests conducted to gauge whether or not airport screeners are up to snuff. Investigators succeeded in bringing explosives and banned weapons through airport checkpoints more often than nine-out-of-ten times. In one occurrence, according to ABC, an undercover agent was stopped after triggering a magnetometer, but still was able to sneak through the TSA checkpoint with a supposed explosive device taped to his back. "The numbers in these reports never look good out of context, but they are a critical element in the continual evolution of our aviation security," Johnson said Monday. Johnson directed the TSA "to immediately revise its standard operating procedures for screening to address the specific vulnerabilities identified by the Inspector General’s testing." In addition, the DHS secretary said the TSA must improve training for all transportation security officers and offer intensive instruction for supervisory personnel; retest and re-evaluate airport screening equipment; and continue random covert testing, according to the Associated Press. Johnson added that in the last year, "TSA screened a record number of passengers at airports in the United States, and ... seized a record number of prohibited items." The US Senate is currently sitting on the confirmation of President Barack Obama's candidate to head the TSA, Coast Guard Vice Adm. Pete Neffenger.